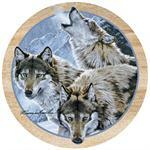 Our coaster line is made by Thirstystone, the leader in manufacturing functionally absorbent, decorative coasters. 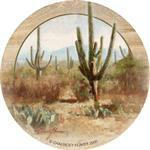 These coasters are made of 100% natural sandstone quarried in the southwestern United States and are mined, created and packaged in an environmentally manner. 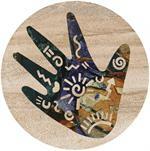 Each coaster is backed with cork to protect your furniture. Created, made and printed in the USA. Due to the nature of natural stone the exact patterns on the stones will vary from set to set. Click here for care and more information. These coasters are not available for overseas/international shipping except by telephone order due to their weight. The international shipping chart does not apply to these items. Sonoran desert with towering saguaro cacti and other native vegetation against a backdrop of mountains with Arizona written on it. Made in USA. 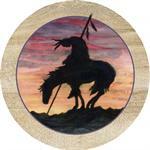 Silhouette of an Indian and his pony against the sunset sky. Made in USA. 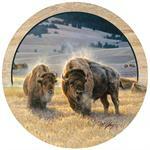 Sandstone coasters with Buffalo standing in the grasslands. Made in USA. 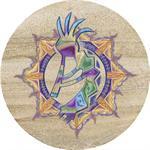 Colorful coaster features a stylistic kokopelli in the center with a band of various colors of small kokopelli and sun symbols on the outside. 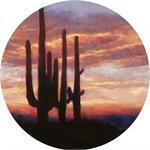 Trio of Saguaro Cactus create a silhouette against the colors of a southwest desert sunset with purple shaded mountains in the background. Made in USA. 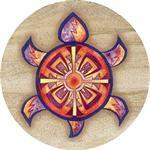 Southwestern style sun rests atop the faded indian design background. Made in USA. 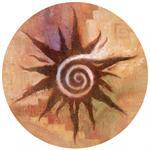 This coaster features shades from dark chocolate to creamy mocha that swirl in bands across the front. . Made in USA. Colorful southwest desert turtle with southwestern design on shell and body. Made in USA. 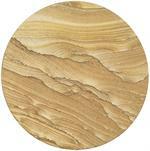 Shades of brown flow and undulate over the front of this sandstone coaster that looks like a river of desert sand . Made in USA. 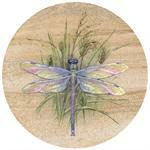 This coaster features a beautiful dragonfly with iridescent wings of pink, green, yellow and purple which highlight it's multi colored body at rest upon some green grasses. Made in USA. 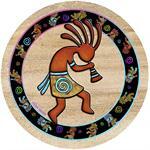 Natural background creates a backdrop for a close up Kokopelli done in bright, vibrant pastel colors. Made in USA. Soothing earth tone colors flow across the natural sandstone coaster in undulating bands of varying shades. Made in USA. 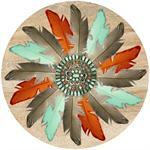 Varying colors of feathers fan in a circle around a turquoise and coral "jewel" center on this natural color sandstone coaster. Made in USA. 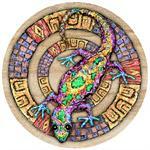 Colorful lizard sits atop two circles full of brightly blocks of southwest designs . Made in USA. 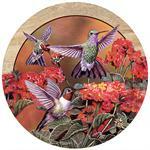 Colorful coaster features three species of hummingbirds in a garden of flowers. Made in USA. 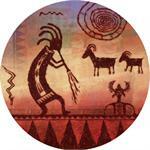 Vibrant sandstone coaster set has indian cave art type drawings that include a kokopelli, snakes, sheep, sun and more. Natural sandstone background creates a backdrop for this unique native american design with symbols. Made in USA. 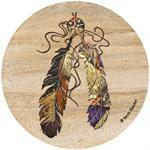 Two feathers with jewel like colors with a southwest indian design blended into the feathers. Made in USA. 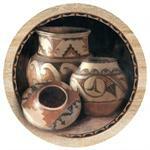 Three varying sizes of beautifully crafted Indian pots. Made in USA. 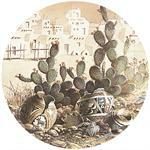 Indian pueblo creates a backdrop for the broken indian pottery in front of the blooming prickly pear cactus. Made in USA. 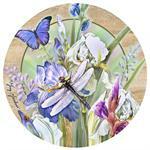 Colorful coaster features Iris garden complete with dragonfly, butterfly and a little red ladybug. Made in USA. 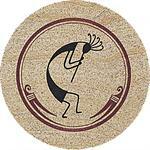 Natural Sandstone Coaster with Dancing Kokopelli with outer design. 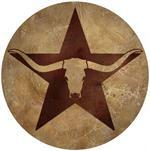 Natural background highlights the rustic brown star with longhorn cow head in the center. Made in USA. 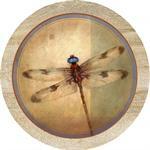 This sandstone coaster set features soothing earthone background with faint scirpt writing highlighting an elegant but subdued colored dragonfly. Made in USA. 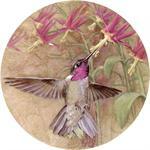 Violet throated hummingbird feeds on violet and cream flowers on this delicately pastel hued coaster. Made in USA. 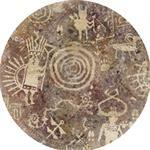 Petroglyphs cover this coaster which is done in neutral earthtones . Made in USA. 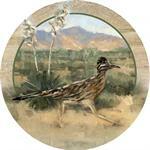 Roadrunner runs across the desert with ocotillo cacti and desert mountains. Made is USA. 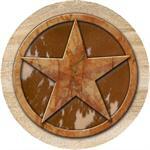 Rustic Star that looks like marble imposed upon a background that looks like leather with three dimensional look . Made in USA. 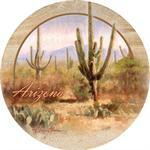 Arizona sonoran desert with towering saguaro cacti and other native vegetation against a backdrop of mountains. Made in USA.